Caregivers and seniors are exposed to so much unique stress in their everyday lives. So, it makes sense that you need similarly unique ways to relieve that tension. Yoga and meditation can be the self-care combo that melts away that stress. Here are some reasons and tips for getting your own practice started. For caregivers and seniors, the primary purpose of meditation and yoga practice is improved mental health. If you get started with yoga, however, you may also be boosting your gut. The flow and work you do through yoga practices can actually encourage healthy processes throughout your digestive system, and that regular movement can help those healthy gut bacteria thrive too. As an added benefit, balancing out your microbiome can also help balance out your mood. So yoga really can be good for your body and brain in many different ways. But if you really want to promote a healthy gut and digestive system, adding fermented foods like yogurt is another way to up the ante. Try a refreshing smoothie that includes yogurt for a pre-yoga workout snack or even a healthy breakfast. Ask any seasoned yogi and they will tell you one of the biggest challenges of practicing is actually stepping onto your mat. It’s important to practice regularly to really get yourself into the habit of using yoga and meditation so you can derive the full benefits. One way to encourage your practice is to dedicate a space in your home. All you need for a relaxing space is an area to stretch out and some basic supplies, like a mat, a block and a full-length mirror. Those items won’t take up too much space, but it’s still a good idea to clear away any clutter. Consider this the perfect opportunity to remove items that are taking up both emotional and physical space. Give yourself time to decide by transferring anything you don’t need to a storage unit (a 5’x10’ unit rents for only $109 a month at Storage Etc-Los Feliz). Whether it’s temporary or long-term, having that extra space can make a difference for your mental well-being. Setting up a dedicated meditation and yoga space is a wonderful first step to encouraging a regular practice. Finding the time to practice, however, can be a challenge for seniors and busy caregivers. One method for making your meditation habit stick is to practice in the morning. By meditating as soon as you wake up, not only are you getting it out of the way, but you’re also setting the tone and mood for the day. If you tend to have a hard time remembering to wake up and meditate, you can also use a handy meditation app to set reminders. The guided meditation that apps like Headspace and Insight timer provide are helpful for caregivers who are just getting started in their practices. Caring for a senior loved one is a selfless act. So it’s no wonder that many caregivers feel guilty about taking time for self-care practices like yoga and meditation. Before you set your self-care needs aside though, you need to know that caregivers need self-care to survive. Taking a few moments to breathe or work through poses is just as vital for your mental health as sleep and exercise. Plus, caregivers who practice regular self-care are less likely to experience burnout. Caregiver burnout symptoms include depression, anxiety and overall poor mental health. So before these effects begin to set in, consider reducing your stress and improving your overall well-being with a little yoga and meditation. As a caregiver, providing care to others is pretty much second-nature. You provide so much for your senior loved one every day, but you deserve some care and attention too. 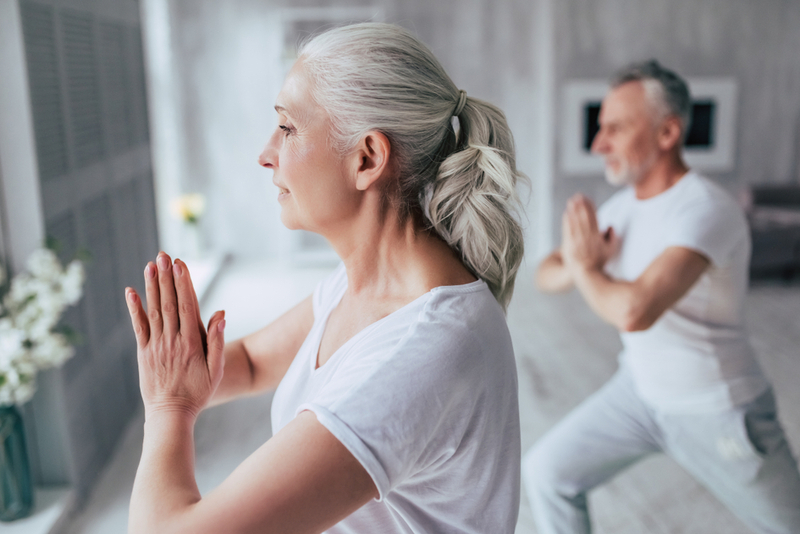 Beginning a yoga and meditation practice can be a great way to add that self-care into your life, and into the life of your senior. So get started today. Jason Lewis is a personal trainer, and in 2002 he became the primary caretaker for his mother after her surgery. During this time he realized there is a special need for trainers that can assist the seniors in our community. Jason worked with his mother’s doctor, as well as other personal trainers, to create programs that are considerate to the special health needs of those over the age of 65.